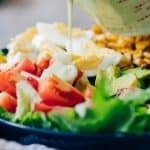 Creamy avocado blue cheese salad dressing is the best homemade blue cheese dressing you’ll try – its lighter because it’s yogurt based and has a sharp taste that’s perfect when drizzled on your favourite cobb salad. You can use this dressing to a pasta salad or even use it as a dip! It’s time to bring out the salad bowls! It’s starting to get pretty hot around here and salads are the only things I can even attempt to eat in the afternoon. With a big bowl of yogurt! Is that a weird combination? I’m just happy it works. It keeps me going at the hottest time of the day and doesn’t make me too hot. Food and temperature? I’m sure that’s a thing. I think a good blue cheese dressing is a tough one. I’ve had some that are too sharp – and then some which are too watery or not sharp enough. It’s so important to create a balance. When I was making a cobb salad the other day (recipe coming on Wednesday), I experimented with a mayonnaise based blue cheese dressing but it was too heavy. Enter avocado and greek yogurt and tadaa!! This is a creamy avocado blue cheese salad dressing that’s just right. It creamy but light, and has just the right amount of sharpness from the blue cheese. With blue cheese, a little goes a long way. 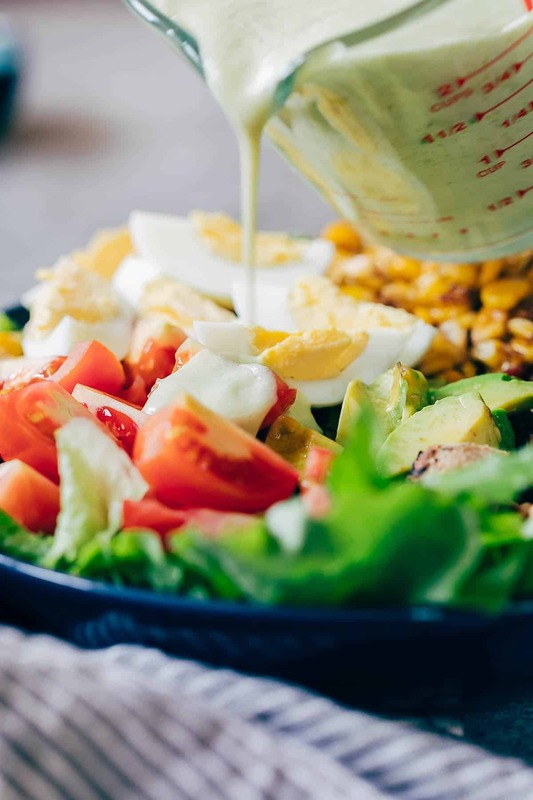 We usually have all of these except the blue cheese at home, but when you have a dressing that Denver specifically comments on, it’s worth stocking! 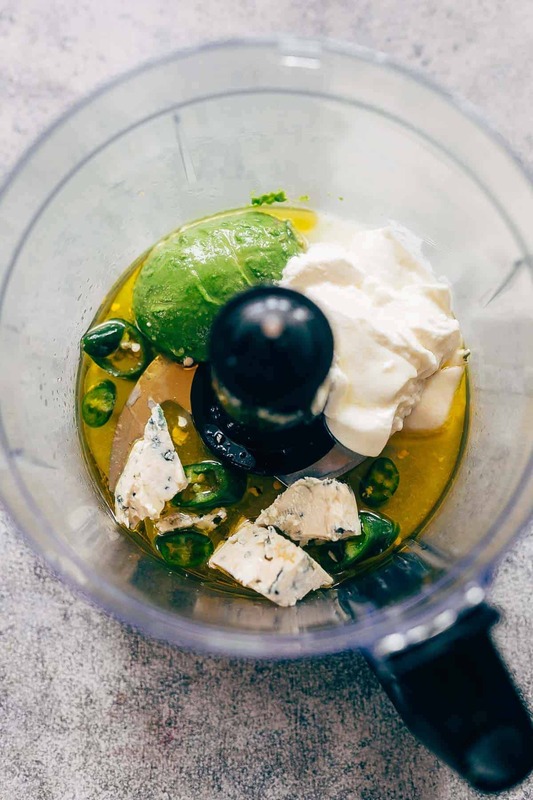 You just add all these ingredients to a blender or food processor and you have a super creamy dressing that’s worth fighting over! How long can you keep Blue Cheese dressing? This blue cheese dressing lasts up to 7 days in the refrigerator. Since it has avocado in it, it’s best to consume it between 5-7 days. The acids in the lime juice keeps it from spoiling. While blending this dressing, you may need to run a spatula around the sides once or twice because the blue cheese tends to stick. 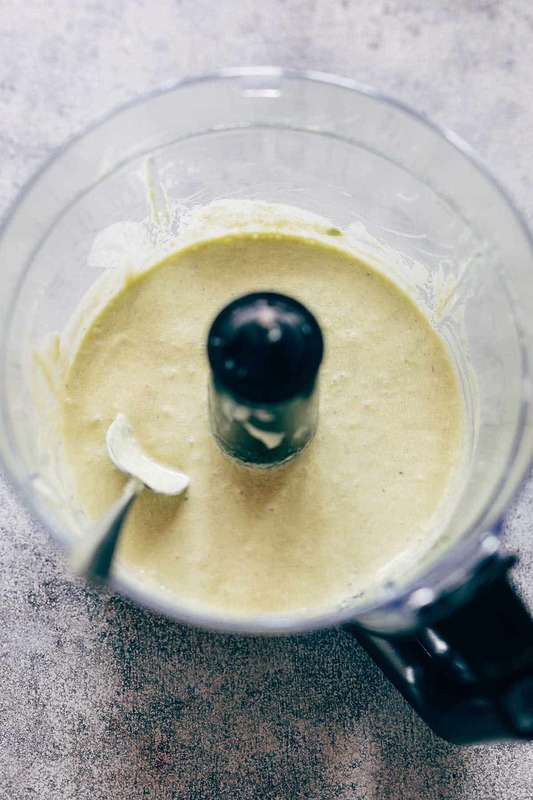 I also like to add a little bit of water to thin out the dressing because avocado and the greek yogurt make it more like a dip and you can choose to keep it that way, but I prefer my dressings pourable consistency. In fact, this is also a great recipe if you want to make a blue cheese dip. I’m imagining french fries dunked in this sauce – somebody stop me!! I have the perfect salad recipe to go with this creamy avocado blue cheese salad dressing coming up on Wednesday! Psst. it’s a loaded cobb salad. Because why not! Place all the ingredients in a food processor or blender along with 1/4 cup water and blend till smooth. You may have to use the spatula to clean the sides once or twice because the blue cheese tends to stick. Use as a salad dressing or omit the water for a thicker dressing that also doubles up as a dip! these sound really really good. im not the one to go for blue cheese dressing but i think with avocado, this will be delightful. Thanks Dixya – blue cheese dressing can be a little funky but this one is just right!